She Told Me offers you 100% Adsense revenue earned from your scoops. Sounds too good to be true? Actually it is! 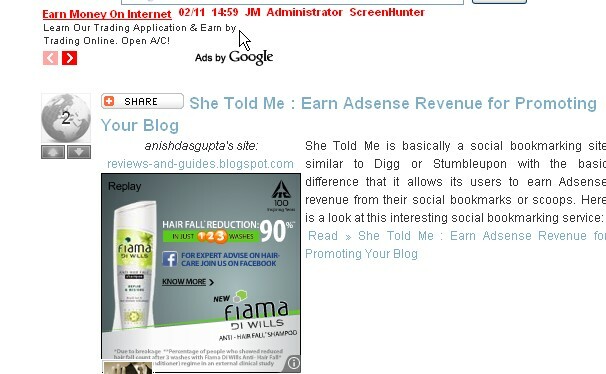 What She Told Me actually does is put a small Adsense ad on top of your scoop and you earn revenue from that only. So, personally I feel it is quite unlikely that you will ever earn anything substantial from She Told Me. However, She Told Me is pretty good at generating traffic site and that is after all the main criterion for a good social networking site. She Told Me is most closely resembles Xomba bookmarks (i.e. you must write a short 200-500 character description to your shares) with the obvious difference that scoops (on She Told Me) offer Adsense revenue share while Xomba bookmarks does not.